It’s great to have your own consumer grade carpet cleaning machine for your home. You can maintain your carpets with good results while saving some money by not hiring a professional carpet cleaner. Our recommendation for those of you with your own home machine is to hire a professional carpet cleaner about every two years. As good as the consumer carpet cleaning machines have become they do not have the power to get the deep down dirt in your carpet. One of our recent customers has been using a consumer grade carpet cleaner to maintain her carpets without hiring a professional for years. 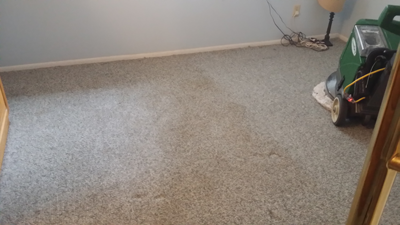 She felt her carpets were extremely clean, but after cleaning half the room it was clear that her carpets needed a professional carpet cleaning. See the accompanying picture to this article. We’re not saying that consumer grade carpets cleaners are bad, in fact we are saying the opposite. They’re great for maintenance cleaning and everyday spots and spills, but you shouldn’t rely on them to do heavy soil removal from your home. Professional equipment and solutions remove on average 64% more soil from your carpet. For regular maintenance we highly recommend getting a high quality vacuum cleaner, and vacuuming twice a week to keep your carpet looking its best. The Carpet and Rug Institute (CRI) highly recommends a sealed vacuum (one with a bag) with a good HEPA filter instead of the bagless uprights that have become so popular. Whether you are using a vacuum cleaner or a consumer grade carpet cleaner we still recommend professional carpet cleaning to be a part of your carpet cleaning routine. For a free estimate call Chem-Dry of Tampa FL at (813) 402-8403.